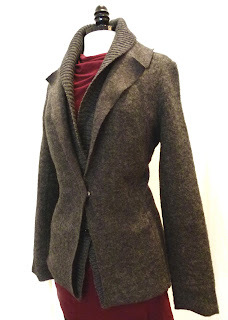 Katherine Barclay is back for fall with a new take on the wool coat. The outer layer is felt-like in texture, allowing the designer to cut such striking lapels. The “sweater” underneath gives you a layered look, without the bulk and heat of a pullover. Leave the jacket unbuttoned and show off the hidden skinny belt. This versatile piece looks sharp with fall’s plum tones.